JBL- GTX 1200T- 12 inch Bass Tube is a must buy for audiophiles for whom music is meditation and nothing else matters than great sound quality. This bass tube consists of a subwoofer tube that ensures enhanced performance and reproduces low bass frequencies. The dimensions are of 13 inch x 26 inch (330mm x 660mm) and they enhance the aesthetic value of the living room or any area where it is kept. Purchase one soon and enjoy your favourite music tracks with great sound effect! The sound of the word, 'deals' & 'discounts' is fascinating to all. Infibeam's deal of the day, brings products with captivating discounts on a range of products! 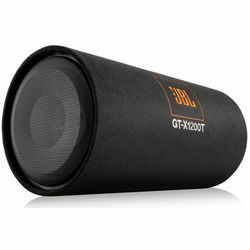 JBL- GTX 1200T- 12 inch Bass Tube is a must buy for audiophiles for whom music is meditation and nothing else matters than great sound quality. This bass tube consists of a subwoofer tube that ensures enhanced performance and reproduces low bass frequencies. The dimensions are of 13 inch x 26 inch (330mm x 660mm) and they enhance the aesthetic value of the living room or any area where it is kept. Purchase one soon and enjoy your favourite music tracks with great sound effect!The sound of the word, 'deals' & 'discounts' is fascinating to all. Infibeam's deal of the day, brings products with captivating discounts on a range of products!